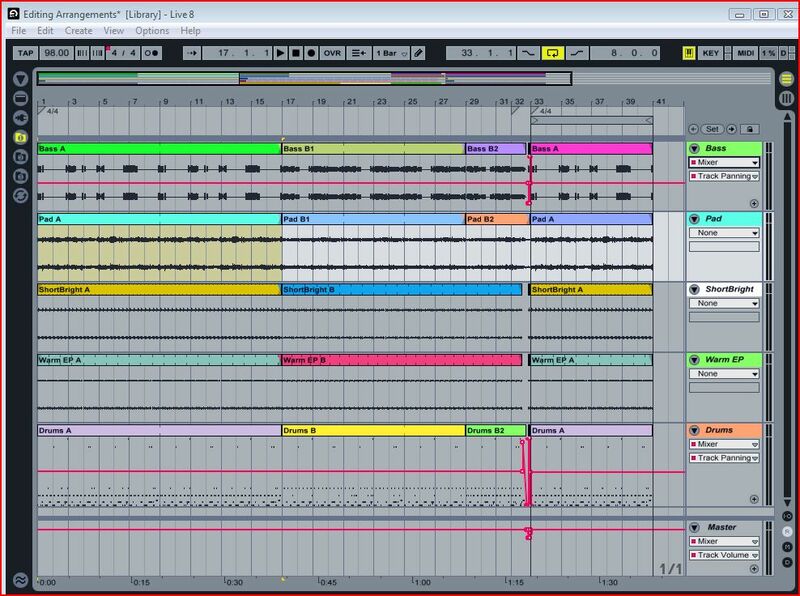 My main, indispensable tool for the last many years has been Ableton Live. This may not be the perfect music and audio production software, but it’s closer than anything else I’ve ever tried, and I’ve tried pretty much everything. Between version 8 and 9 was 4 years but I never had a problem with a song because of bugs or missing features. Personally I’m perfectly content with its features and performance and am a little glad It was nice to be off the upgrade bandwagon for a few years to concentrate a little more of making tunes. If I was only allowed one sequencer on my computer it would be Live. I’ve been using it for most of my composing, arranging and production since 2001 or so (version 1.5 and 2.0). What appealed to me about it at first, and still does, is the rapidity with which you can “prototype” an arrangement. It may not have the intricate editing capabilities of a full-featured DAW like Logic or Sonar, but over the years that has been largely remedied. An analogy came to me the other day as to why I think this is such a good tool. Although I’m not a sculptor or craftsman, I’m imagining a set of tools that are so convenient and so powerful that it makes going from a concept to a finished piece much faster than any other technique. For instance, suppose that you had discovered a scuplting medium and special tools that allowed you to sculpt statues or busts in a fraction of the time it took when you used classic materials and methods such as clay, marble, wood, etc. That’s the way I feel about Live. Live was originally aimed primarily or at least largely towards live performance (thus the name) with the arranging and mixing capabilities added in. But I never use it that way. Still, with the features that have been added over the years (MIDI, VST, ReWire) it has 90% of what I need to do what I want to do. The only significant thing it doesn’t have compared to big DAWs/sequencers is event lists/quantitative data fields (i.e, allowing you to enter specific numeric values for velocity, envelope values at times, etc.) but that’s really a small limitation considering all the unique features and design genius it possesses. Basically, their design philosophy for the program is that the controls for the things you spend 90% of your time working on are all quickly available, but beneath that are controls to do those less frequent but still crucial functions. Wow…finally figured out Beat Repeat! OK, I’ll confess this. I been using Live for 10 years, and was intrigued like many other people with the release of the Beat Repeat processing device in version 5. But due to a lack of mental horsepower and perhaps not the clearest documentation, I could never really figure out how it was different from, say, a delay unit or something. For some reason, the other night I picked up the Live 8 manual to read for a while before going to sleep and suddenly it all became clear. +5: gapless audio! As far as I can tell, it’s almsost impossible to get the audio engine to stop or hang, no matter what you do. Even though I don’t play live, this is a great feature while you’re composing. You can throw in new audio, turn loops off and on while playing, and Live’s audio engine just seems to keep steaming along. -2: everything in one executable. Support for all the control surfaces, and code for all the optional instruments, are all globbed together into one huge executable. I’m sure Ableton thought a lot about that architectural approach, and they have tradeoffs in terms of distribution, but it does seem sort of cumbersome. There are tons of features and instruments I will probably never use, but am still “carrying them around” anyhow. I just read that there is now a “mini-Live” for only USD100 (download). This has some limitations that the full version doesn’t have, like limiting VST plugins to 4 instruments and 6 effects, absence of Complex warping modes, no track grouping or REX file support, etc. But for the price I think a lot of people could make good use of it. And if you do want to upgrade to full Live 8 it’s a bit less painful on the wallet later. -1: Even though they fixed these, it took so long that I have to register a ding: multiple envelope lanes per tracks, and >128 controller support for plug ins. It appears that even if you don’t own the add-on instruments, live Analog, Tension, Operator, etc., you still need to install the demo versions in the Library or it will report problems when you groom it. Hmmmmmmm…. These are not necessarily the touted ones, but those that I found that made it worthwhile to upgrade. 1.0 Initial release (actually, the very first time I used Live it was version 1.5. You only had one warp mode, it didn’t support MIDI, most of the GUI was not resizeable, etc. 4.1 – Advent of Operator plug in FM synth. 8.0: Track grouping. When arrangements get to contain too many tracks, being able to group them away in these virtual “folders” is really helpful. I have a 23 inch monitor and it still gets too crowded. And finally! A way to access plugins with more than 128 controllers! (especially Dimension Pro which I use a lot). This is huge. 9.0 Lots of incremental and workflow improvements; much faster Library searches, etc. I finally went to Windows 7 to take advantage of my 4 GB of memory, now that I am using BFD Drums.